Dr. Parsa Mohebi has invented a state-of-the-art app known as “Hair Now”, which lets patients see what their hair restoration results will look like after undergoing a hair transplant. Dr. Mohebi decided to develop the app because of patients’ requests for a software that can give them an idea of how they will look after their hair transplant. “Patients that come and see me for a hair loss consultation are anxious to see the way that they will look after a hair restoration. Dr. Mohebi hopes that this app will set realistic expectations for patients who are considering a hair restoration procedure, while giving them a better understanding of what can be achieved through hair restoration procedures. This free app is designed to be easy to use. The first step involves taking a picture of yourself, or uploading a picture from your mobile device. The app will then allow the person to search through a comprehensive photo gallery of former hair loss patients with different patterns of hair loss, color, quality, and thickness of hair, in order to find a look that most closely matches your hair loss. 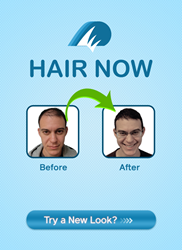 After selecting a matching hairstyle, the app will overlay the chosen hair over the person’s picture. Then they can further customize it until they are completely satisfied with the results. People who use the app can send their own before and after picture to the doctor for an initial evaluation or to schedule a hair restoration consultation. Hair Now also allows people to share their new look with friends and family by posting their before and after picture on Facebook or other social media sites to get feedback. Although the app is designed to give the most realistic representation of how a patient would look like with their new hair, it does come with a disclaimer which states, “The hair images from “Hair Now” are extracted from photos of real patients after their hair restoration procedures.